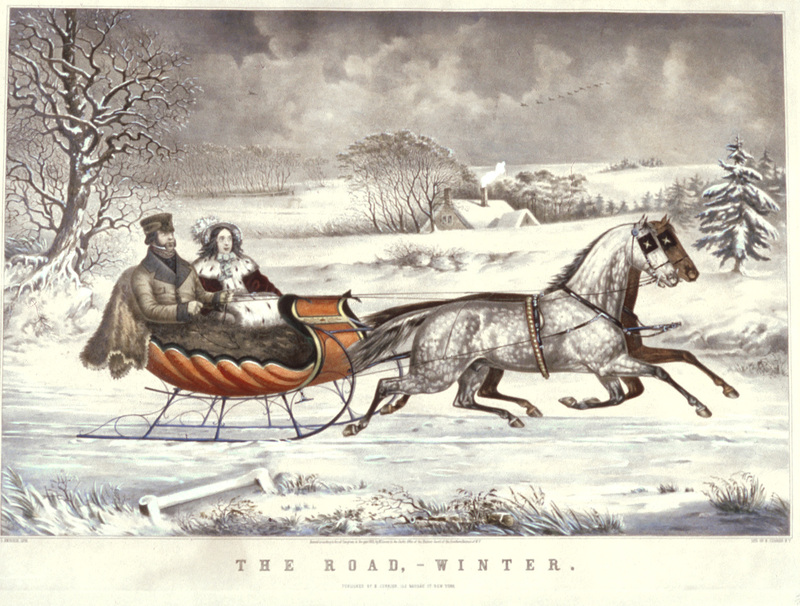 Courier and Ives – “A Road Winter.” Winter was actually best for travel. The Christmas holiday in Canada has come a long way from the days of pioneer Canada. However, for though the tree wasn’t loaded with gifts, those small log cabins were filled with love. 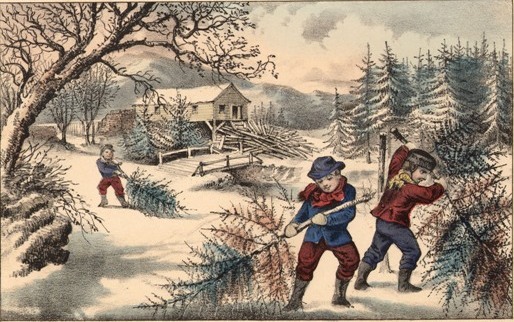 Even though the Christmas tradition was well-established by the time Canada was settled by Europeans, early pioneers did not celebrate the holiday as we do today. Most pioneer families did not put up a Christmas tree. Small log cabins held no space for such a frivolous item. Secondly, United Empire Loyalists were of English, Scottish, and Irish descent and the tradition of the Christmas tree did not originate in these countries. The joy of selecting a tree. It was a family ritual that taught compromise. The Christmas tree came to Canada with settlers from Pennsylvania who were of German descent. The idea originated in that country. It was not until Queen Victoria’s husband, Prince Albert, introduced the Christmas tree to England that United Empire Loyalists in Canada took on the tradition. British families had a custom of hanging greens. This was more appropriate in the cabins of Upper Canada. 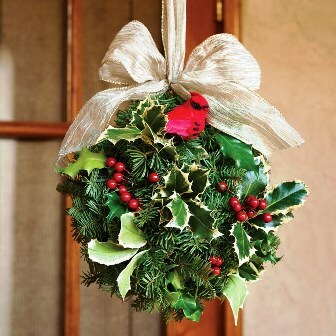 English greens consisted of ivy, mistletoe, and holly. These were not available in Canada during the winter months, so evergreen boughs were hung and made into garland. These garlands decorated mantles, stair banisters, and exterior doorframes. A typical Christmas kissing ball. It was an acceptable way of getting a smooch from the guy or girl you’ve had your eye on. England had the Christmas tradition of the kissing ball. In Upper Canada, the kissing ball took a different form. A garland was woven into a hanging ball that hung from the rafters. This ball took the place of the Christmas tree. All decorations were natural such as nuts, berries, feathers and pinecones. Cranberries and popcorn chains were made. Cranberries were plentiful in the bogs and Canada’s Native People’s had introduced popcorn. After a few years, calico bows, ribbon and lace were used. Children made figures out of straw and yarn to decorate the Christmas ball and garland. Cookie dough figurines and gingerbread men were not used to decorate the tree until after 1860. 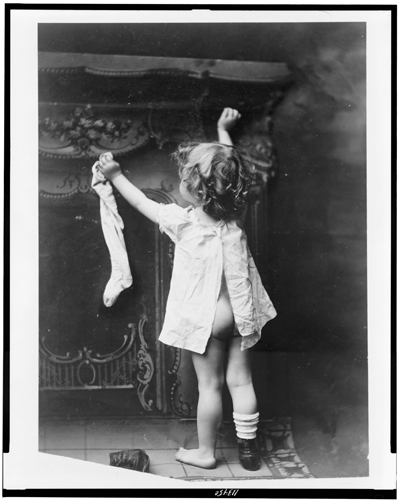 Stockings were hung on the mantle or bedposts. If the harvest had been plentiful and the children well behaved, the stockings were filled with presents. A gingerbread man may have been included, but if so it would have been molded by hand. There were no cookie cutters, wrapping paper or cards. Often, an apple was dropped into the stocking and possibly a treasured item such as a jack knife or cornhusk doll. Perhaps if someone in the family knew how to whittle, a wooden puzzle or figurine would be found. 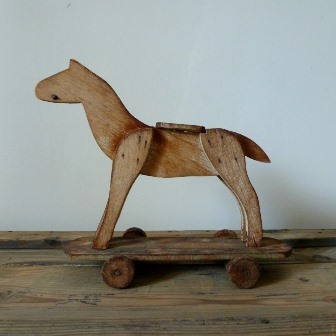 Wooden rocking horses were often made for small children. I once saw such a horse at an antique sale. The carver had hand-rubbed the contours of the horse to a smooth finish and had added a horse hair mane and tail. Then, he had painted eyes and a saddle. The horse was a magnificent specimen of early Canadian handcrafts. Other toys given to children were such treasures as a homemade sled or snowshoes. These brought many hours of winter fun. Children made gifts for their parents and siblings. Potpourri, sachet, and pomander balls were often given to both men and women. Handkerchiefs were hemmed and scarves, mittens and hats were knit. Girls as young as five-years-old could hem by hand and knit. How happy and proud a child would be to wake up to something like this. It may look rustic, but it was made with love. If there was a nearby town or trading post, often pennies would be saved to purchase a gift of pins, needles, thimbles, threads and a pin-cushion for the lady of the house. Duck down was collected all year to make pillows and cushions. Candy was made as well as cookies. The candy was shaped into sticks or balls and was flavored with fruit juice and peppermint. On Christmas morning the stockings were emptied and games of hide-the-thimble or blind-man’s bluff were played. Wild turkey or goose was most often served along with mincemeat pie and plum pudding made with hand gathered fruit. I can remember Grandma baking for days before Christmas, the smell of fruitcake, mincemeat pies, and currant pudding making her kitchen a most inviting place. 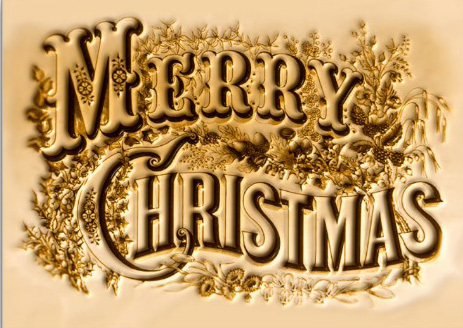 The 1800’s brought many changes to the Christmas tradition both in Canada and the world. In 1800, tree ornaments began to be manufactured in Europe. In 1822, Clement Moore wrote “A Visit From Saint Nicholas,” for his family. Today, we call it “The Night Before Christmas,” and children all over the world look forward to its telling. There was no electricity in many parts of Canada as recent as the 1950’s. I remember as a small child, going to Grandma’s for Christmas. Grandma didn’t have hydro but she did have a beautiful tree. Usually, it was spruce. Fastened on the end of each branch by a silver clip were small red and white candles. Grandma had a mold and made these candles for the tree each year. In 1896, the T. Eaton Company of Canada produced its first Christmas catalogue. I can remember waiting with eager anticipation for both the Eatons and Simpsons Christmas books. My siblings and I would pour over the pages until they were dog-eared and tattered, trying to make our choices. We were allowed to ask for only one thing. It was a difficult choice. Eatons quit producing a Christmas catalogue many years ago. It saddened me to see them go. Many childhood memories are of Eaton’s where my aunt worked as a seamstress.. In 1905, the T. Eaton Company of Canada started a tradition. SantaClaus arrived by wagon at the store in downtown Toronto. Malls and department stories still continue to promote the arrival of Santa Claus. Christmas has come a long way from the days of pioneer Canada and I often think we have forgotten the true meaning of the season. It is a time of giving and sharing. A time for families. A time to give of ourselves. Even though the tree wasn’t loaded with gifts, those small log cabins were filled with love.